This article is patrt of a series on the Best Second Life tools. OpenSim and Second Life have many wonderful artists who can sculpt and build wonderful items. Everywhere I go I see great looking animals and objects. But they are just sitting there! Maybe they move a head or blink and eye, but that's about all I see. It makes it far more dramatic when your critters move and exhibit animal-like behavior. There seems to be a lack of knowledge or skill on how to do simple movements, perhaps because people do not know how to script, or if they do, what tricks you can use to do these effects with. Mesh Frog by Ferd Frederix is licensed under a Creative Commons Attribution-NonCommercial 3.0 Unported License. Based on a work at www.outworldz.com. The first step is to get my zip file, which contains the mesh pieces you will need to assemble this project. Copy the contents of the zip file to a new folder on your disk. Select File->Upload->Model. Second Life and OpenSim users must use a mesh enabled viewer such as Phoenix, the official Second Life viewer, or Firestorm. I will be using Phoenix, so your screen layout may look different. You will need to able to upload mesh files with this project.If you have not yet taken the mesh quiz, the Second Life system will prompt you to take a short quiz on intellectual property laws, and then you can upload this project. I used mesh for this project for several reasons. 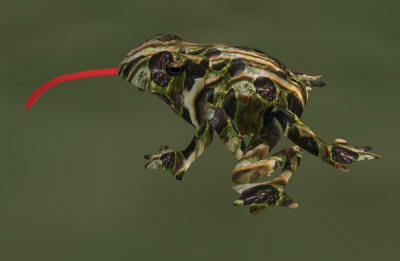 It makes a better looking and faster rezzing frog. As a bonus, it is far simpler to upload as it comes in as one piece with all the textures included. 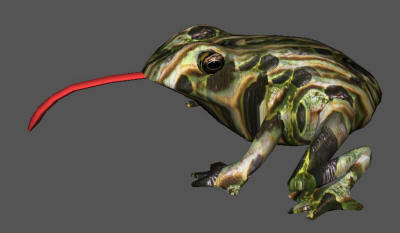 It also reduces the prim count: this frog has 8 legs, a body and a tongue, which would take 10 prims normally. Because it is mesh, the legs are paired up, and it only takes 6 prims. 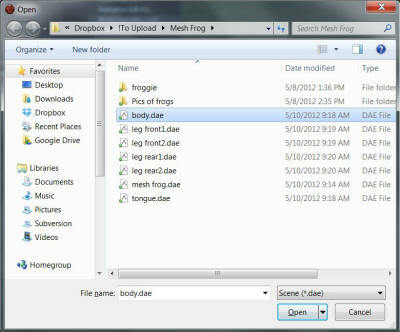 Browse to the folder where you saved the files select meshfrog.dae if you are in Second Life. 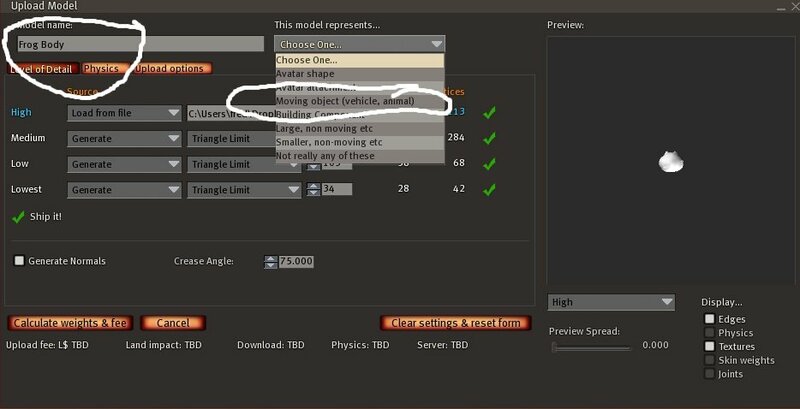 If you are using OpenSim, you will need to upload the body. leg and tongue files individually. Change the Model Name to mesh frog, and select the pulldown menu item for what "This model represents"
Select Moving Object (vehicle, animal). 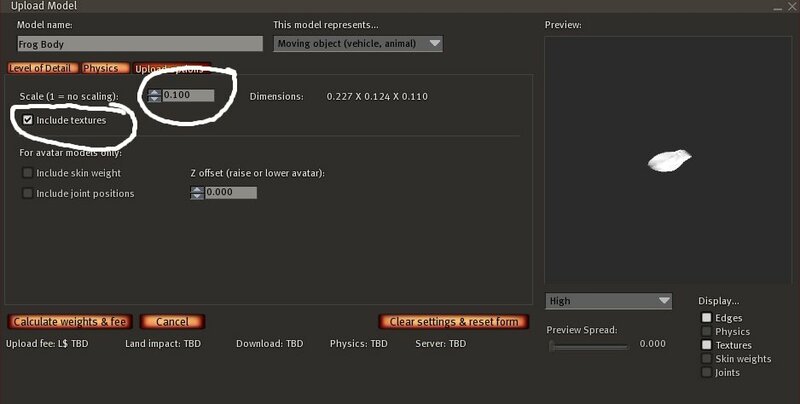 Switch to the Upload Options screen and set the size to 0.100 and check the box for 'Include textures". 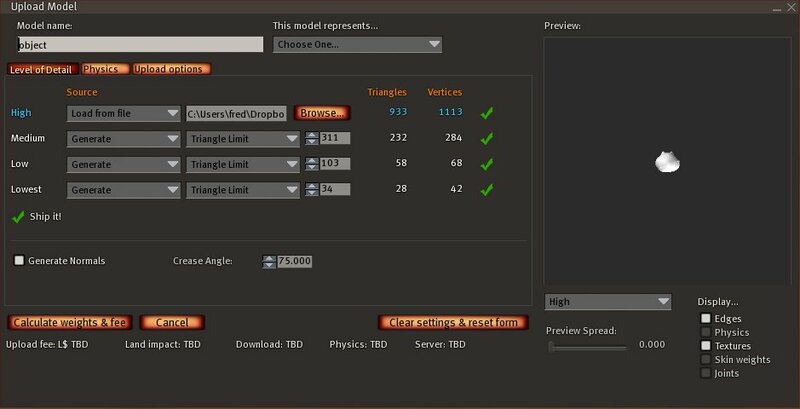 Press "Calculate weights and fees", and then click upload. You should see a frog with a tongue, and 8 legs. Edit the frog. 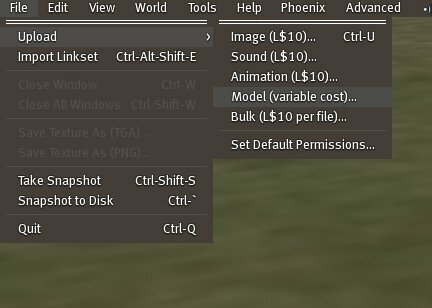 You should be able to select "Edit linked parts" and also be able to move each leg separately. 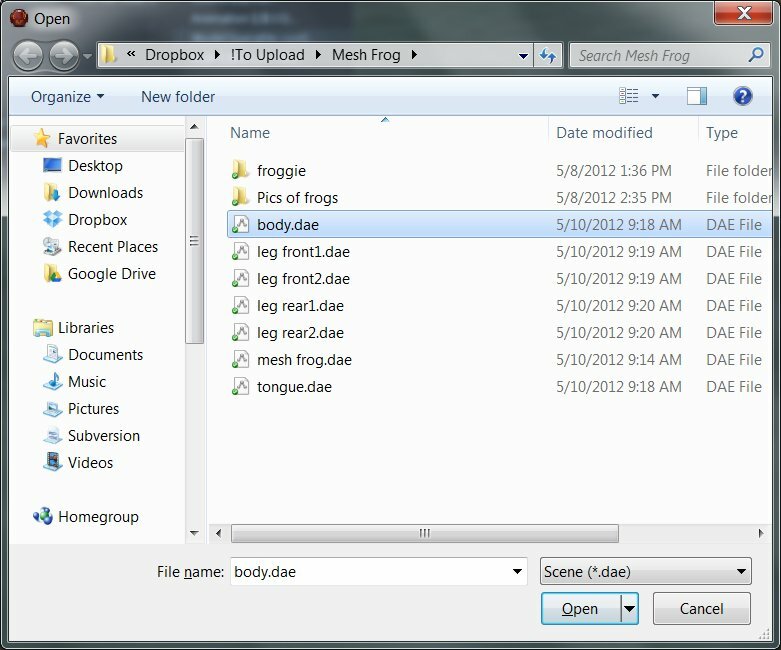 If you cannot do this, you must upload the individual components and put them in the same places as this first uploaded frog has them. They must be editable as separate pieces. Once you have all the pieces together, unlink them with Shift-Ctrl-L, reselect each piece, and click the body as the last item, then link them together with Ctrl-L. Thje body of the frog must be outlined in yellow which makes it the first, or root prim. This piece is where the scripts will go.